It's Easy to Bake Homemade Bread! Bake amazing homemade bread – even if you've never baked before! Several of the recipes are bread machine friendly, and the yeast breads can be mixed with a sturdy mixer so you you can multitask in the kitchen. Just a few minutes to mix, let rise, shape, rise and bake. The quick breads are even easier – just mix and bake! You can make pancakes from scratch in about the same time as using a box mix – without the mystery ingredients. What's in the Bread Book? 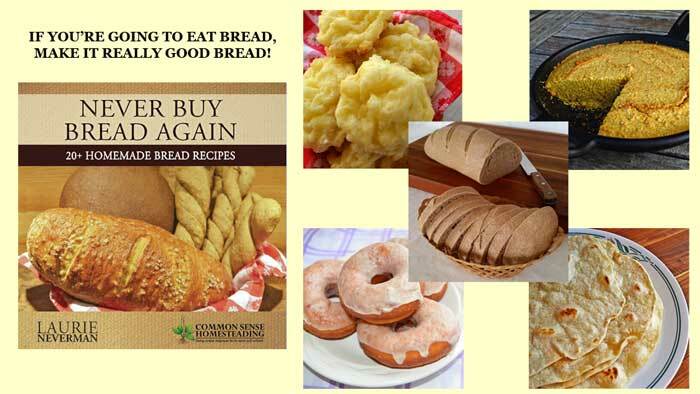 “Never Buy Bread Again – 20+ Homemade Bread Recipes” is the bread book designed for beginning bakers and those who enjoy quick and easy homemade breads. It’s also fun for those who remember recipes “like grandma used to make” and want to recapture that flavor in their own kitchen. 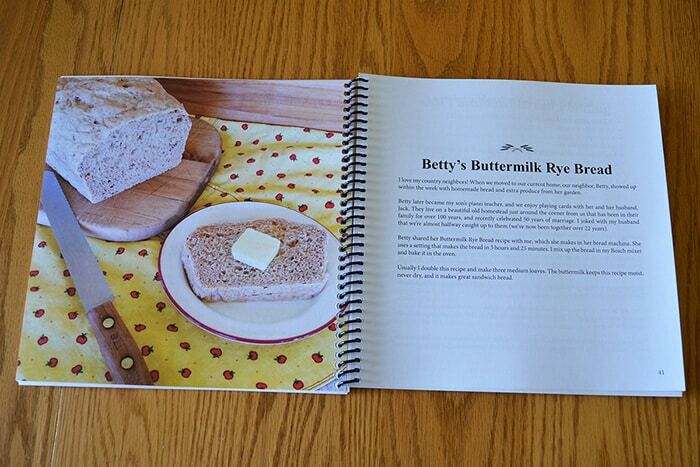 The book includes full color photos, so you know what the finished bread should look like, and stories from our family about the recipes and baking traditions. It has a spiral binding so that it lays flat on the kitchen counter for easy reading while cooking. Some of these recipes have been featured on the website, others are exclusive to the book. Free Bread Baking Video Tutorial – The book includes access to an online baking tutorial video to take you through the basics of bread making. 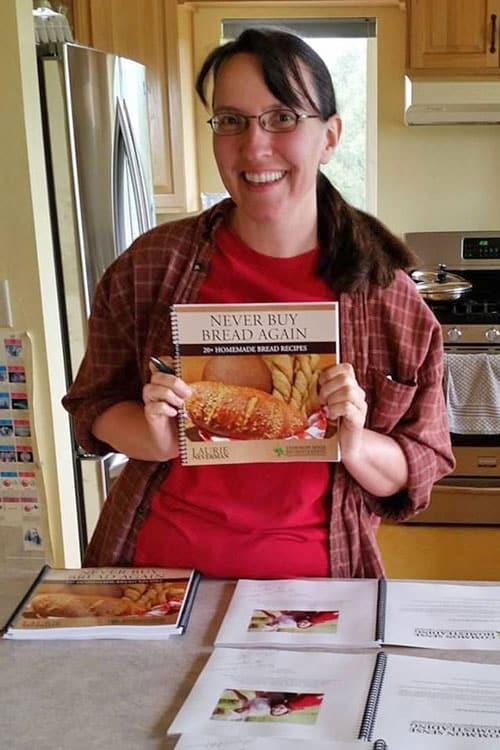 Never Buy Bread Again is available in print and digital formats. 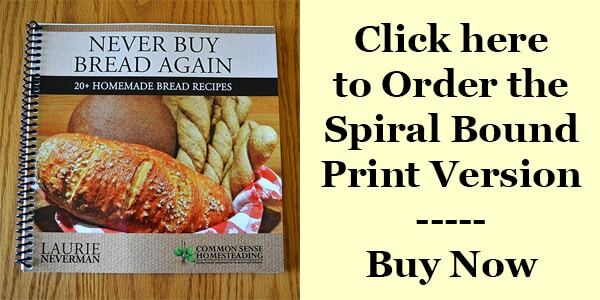 The spiral print edition is available only in the United States. The digital version and Createspace print to order versions may be purchased internationally. Print copies are spiral bound so they lay flat for easy use while baking. The price for the print version is $19.95 (+ sales tax in Wisconsin) and $3.99 shipping and handling. FREE BONUS – With the purchase of your print copy, you'll also receive the digital versions of the book. That's two products for the price of one! Type in the desired number of copies in the Quantity box. If Shipping does not automatically update, use the dropdown arrow to select the least expensive shipping option available. For example, “5.99 (Buy3)” for a purchase of three books. Check out safely with Paypal. You don't need a Paypal account to purchase. It can also process debit and credit cards. We'll mail out orders via media mail twice a week. Print version now available internationally (not spiral bound) for $29.95 via Amazon.com. The ebook (digital) version is $9.95, and includes downloadable PDF, epub and mobi versions of the book. “Thank you for sharing your recipe as this is the 2nd time in a week I have used it. “This recipe SAVED me! I'd just made a total flop on cornbread muffins from a food.com recipe. I know it's foolish to try a new recipe last-minute, but I couldn't find my old standby. So right before a luncheon, I made these after throwing the other “bricks” away. This turned out great! If you enjoy the book, please stop back and leave a comment below! Thank you! I found out in the 70’s I have food allergies + hayfever. The worst one is Yeast. I cannot eat anything containing the least amount! Then I would advise sticking to the quick breads that do not use yeast, if you eat bread at all. Do you have wholesale pricing for resale? I haven’t sold wholesale, but would discuss it. I would like to purchase a small quantity of your Never Buy Bread Again for my small store in Oregon. I just got my cookbook today and so far so great. Have you used flour from To Your Health Sprouted Flour Company? https://healthyflour.com/ this is their website. I haven’t tried sprouted flour, but I have friends who have used it. I’ll send you an email to discuss quantity and pricing.